The unemployment rate fell to 5.8% in October — the lowest rate since 2008. 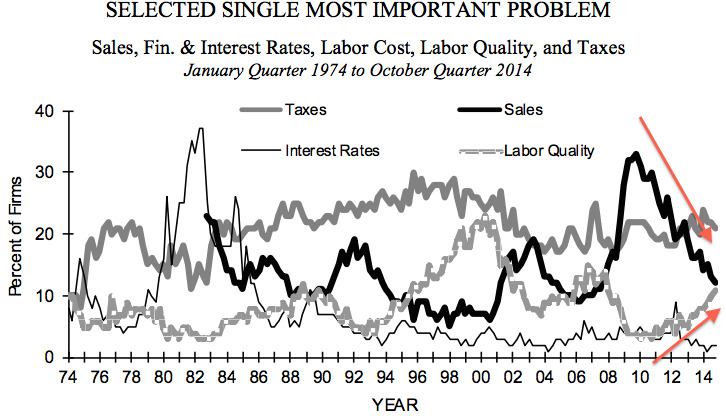 However, good labour in America is still in short supply. At least that’s what America’s small businesses are saying. And that could ultimately mean wages will rise as employers compete for a shinking pool of good labour. Fory-five per cent of respondents say there are “few or no qualified applicants” for jobs, which is an increase from July’s forty-two per cent. This number has been continuously trending higher since 2009. Nineteen per cent of firms have reported actual compensation changes in the past three months. Although this is a slight drop from July and August’s 21% and 22% respectively, this number is still much higher than pre-2009, and has been trending upwards since then. 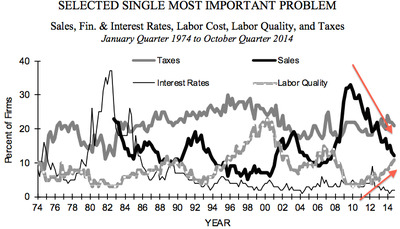 While sales are still one of the bigger concerns for small businesses, it’s seen a major drop as the ‘single most important problem.’ This comes as labour quality becomes the most important problem for more employers. This change suggests that economic concerns are shifting from weak demand to tight supply. All of these factors point to higher wages for America’s workers, which in turn should lead to higher inflation.